If your think your kid is crazy about those kick scooties or even that very girly looking Razor electric scoother then you might be in for a shocker if your kid finds out about the Razor spark scooter that does what it says i.e generates plenty of sparks to draw more attention than required. This razor kick scooter is a spark producing scooter that will definitely catch the attention of any teenage or even adults. Too bad then are only meant for kids and can bear weights not more than 143 pounds. If you are planning to buy your kids scooter then you better hold on before you find out what this scooter is capable of. The Razor spark kick scooter is a true kids scooter and if you put on more weight than it can hold, it will surely break. The scooter itself weigh 5 pounds and measures 33 inches from handlebar to wheels. Unlike other kick scooters, this Razor kick scooter can also fold and becomes very easy to carry and store. After folding it measures 60.32cm x 10.16cm x 18.41cm. 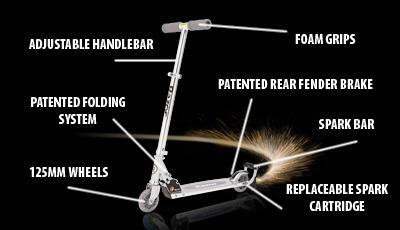 The whole body of this kick scooter including tube and deck is made of aircraft grade aluminum which is the best when it comes to durability. It has brakes in the rear fender and the heat of the scooter lies at the rear end, the spark producing flint bars. When completely consumed, they can be easily detached and replaced with a new spark cartridges. This kids scooter has no suspension i.e it is completely spring less. 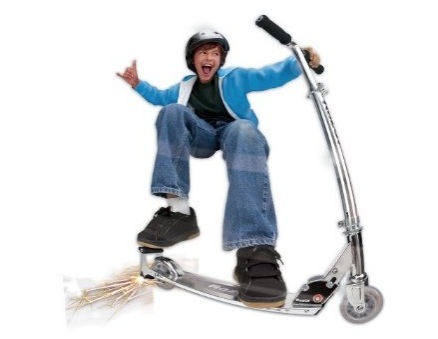 This razor kick scooter is only recommended for kids with ages 8+ and is backed by a 6 month warranty by its manufacturer. Overall this is a nice kick scooter for kids but we still rate it 6/10 because we think that the 1.5 hour life of a single spark cartridge is very low. If your kid is really crazy about those sparks, then make sure you get some spare cartridges along with the Razor spark scooter.